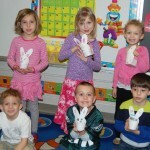 The students in Mrs. Vitti’s kindergarten class at Hambright Elementary are ready for Easter. 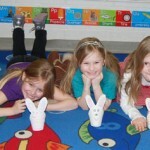 Each student made a bunny “sleeve” that was attached to a small basket. 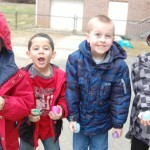 The students then bundled up and went outside for an old-fashioned Easter egg hunt on the kindergarten playground. 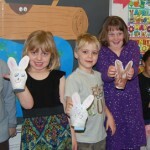 Each student was permitted to find two eggs that had previously been hidden by the elusive Easter Bunny! 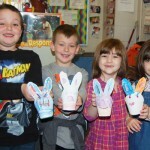 Tucking the eggs in their baskets along with Easter grass, the students have the perfect centerpiece for their Easter dinner table.